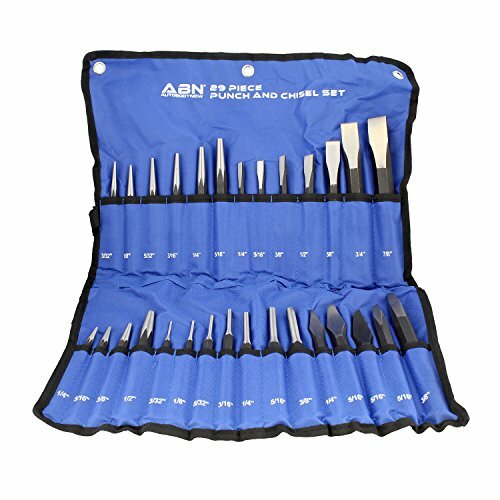 Cut, shape, and remove metal, remove pins, rivets, and keys, drive pins or bolts from force fit holes, and more with the ABN Chisel Punch Set. The punches and chisels in this kit can be used to work on all hard materials and are constructed from chrome-vanadium steel (CR-V) for maximum strength and longevity. This cold chisel and punch set includes 7 pin punches (3/32", 1/8", 5/32", 3/16", 1/4", 5/16", 3/8"), 6 starter punches (3/32", 1/8", 5/32", 3/16", 1/4", 5/16"), 4 center punches (1/4", 5/16", 3/8", 1/2"), 7 flat chisels (1/4", 5/16", 3/8", 1/2", 5/8", 3/4", 7/8"), 2 cape/slot chisels (1/4" and 5/16"), 2 diamond point chisels (5/16" and 3/8"), and 1 half-round nose chisel (5/16") all packed inside a roll-up pouch for your convenience. WARNING: This product can expose you to chemicals which is [are] known to the State of California to cause cancer and birth defects or other reproductive harm. For more information go to www.P65Warnings.ca.gov. VARIOUS SIZES: The longest piece is 8 inches (20.3cm) and the shortest piece is 4 inches (10.2cm); Pin punches - 3/32", 1/8", 5/32", 3/16", 1/4", 5/16", and 3/8"; Starter punches - 3/32", 1/8", 5/32", 3/16", 1/4", and 5/16"; Center punches - 1/4", 5/16", 3/8", and 1/2"; Flat chisels - 1/4", 5/16", 3/8", 1/2", 5/8", 3/4", and 7/8"; Cape/slot chisels - 1/4" and 5/16"; Diamond point chisels - 5/16" and 3/8"; Half-round nose chisel - 5/16"